Who Pays My Medical Bills After My Florida Bicycle Accident? If you have been in a bicycle crash in Florida, find out who is liable for medical bills and how Jim Dodson Law can help. We always tell people the most important thing to focus on after a serious bicycle crash is your health and recovery. You should be getting the best medical treatment for your injury and working to get back on your bike, if at all possible. 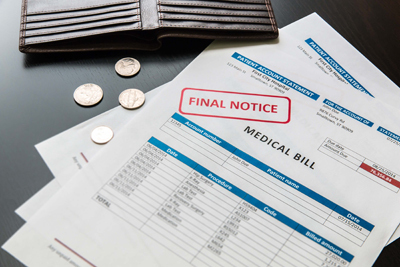 As your treatment progresses, keep in mind the best way to get your medical bills paid. If you were not at fault in the crash, the insurance company will eventually pay your medical bills, assuming the driver had liability insurance or you have uninsured motorist coverage. However, they will not pay your bills as they are incurred. It can sometimes take months, even much longer, to get your case settled and the final bills paid. All drivers in Florida are required to carry $10,000 in No-Fault/PIP (personal injury protection)l benefits. If you own a vehicle in Florida, or live with a family member who does, you should have up to $10,000 in PIP benefits to pay your bills. PIP pays first. If you do not have access to PIP through your own auto policy, the PIP benefits on the vehicle that caused the crash will be available to you. You may have additional medical coverage on your own auto policy under your medical payments coverage. This coverage pays any amounts PIP does not pay until the PIP is exhausted, then your medical payments coverage will pay the bills at 100% until it is exhausted. If you have health insurance, Medicare or Medicaid, it will pay after your PIP/medical payments coverage has paid their limits. When you establish with a treating physician, it helps to make sure they will accept your health insurance, Medicare or Medicaid once the auto insurance health benefits are exhausted. Keep in mind, any health insurance plan, including Medicare or Medicaid, will be entitled to be reimbursed from the settlement of your case for the amounts they have paid on your behalf. Their reimbursement right becomes part of what you are entitled to receive and calculate your settlement value. This issue creates confusion with many people. If you are not represented by a lawyer and are receiving bills from medical providers, EMS, or hospitals, it is in your best interest to not ignore them and force them into collections. Not only will this hurt your credit creating lasting damage to your credit report, it makes reimbursement more complicated when your case does settle. Therefore, we recommend you contact them to work out some type of payment arrangement to prevent them from going into collection. In most cases, if you are represented by a lawyer, providers will reach an agreement to wait for reimbursement until the end of your case. We’d be happy to explain how this works. Please contact us online or simply call our office directly at (888) 207-0905.